Whether you're looking to implement a Customer Relationship System (CRM), or want to build better customer and prospect relationships across your business, you definitely want to ensure you quickly get a return on your investment and create many more repeat profitable customers. 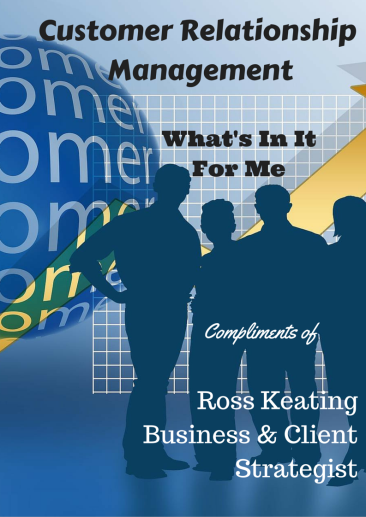 This free e-guide, "Customer Relationship Management - What's In It For Me? ", will show you why CRM strategies and systems can help build your business. Where you can find out what users think about different CRM systems and how they rank them. Want to Chat with a CRM/Social Selling Expert? Click on the button below to book a 30 minute free phone call with Ross Keating, Redback's CRM expert and Business Strategist, to discuss any CRM or Social Selling challenges or opportunities you may be facing in your business. The time is provided without charge and without any obligation to proceed further. Book a Free Chat with Ross!